1 Beat the Egg thoroughly along with the Salt, Mustard Powder, green Chilieses and the Pepper Powder. 2 Melt the Butter in a non stick pan over a low flame. 3 Add the beaten Egg . spread evenly around the pan and sprinkle the grated Cheese on top. 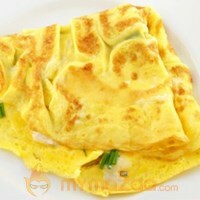 4 Cook on one side Till the Egg is cooked.fold the Egg into half and remove from the flame.serve hot.